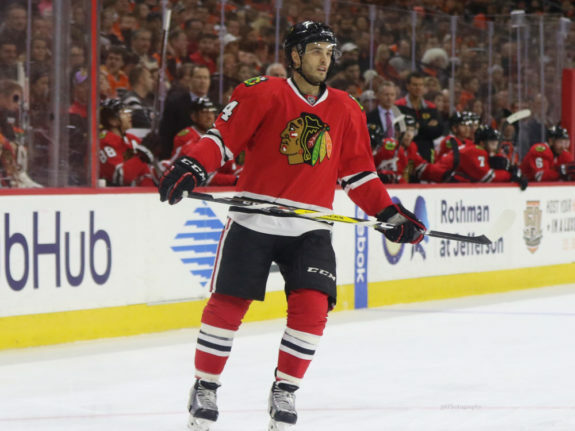 The Chicago Blackhawks are trading veteran defenseman Niklas Hjalmarsson to the Arizona Coyotes in exchange for defenseman Connor Murphy and forward Laurent Dauphin, the Blackhawks announced Friday. This deal comes just hours ahead of the 2017 NHL Entry Draft and is all but certainly a move to free up some cap space for the Blackhawks. Hjalmarsson was originally drafted in the fourth round of the 2005 NHL Entry Draft by Chicago and has played in 623 games over the last 10 years with the team. He scored a career-high in goals this past season with five goals and 18 points in 73 games, though his career-high in points came during the 2013-14 season when he scored four goals and 26 points in 81 games. Hjalmarsson is far from a point producer though as he’s known mostly for his ability to be a shutdown defender tasked with suppressing opposing team’s top lines. A three-time Stanley Cup Champion, Hjalmarsson will join the Coyotes with two years remaining on a contract that comes with a cap hit of $4.1 million per season. A veteran leader with a ton of experience, Hjalmarsson joins a young Coyotes team that is very much in a state of transition after parting ways with starting goaltender Mike Smith, captain Shane Doan and head coach Dave Tippett in the last week. Hjalmarsson has a chance to some of his valuable leadership traits to the Coyotes who don’t seem likely to compete for a Stanley Cup at any point in the near future. 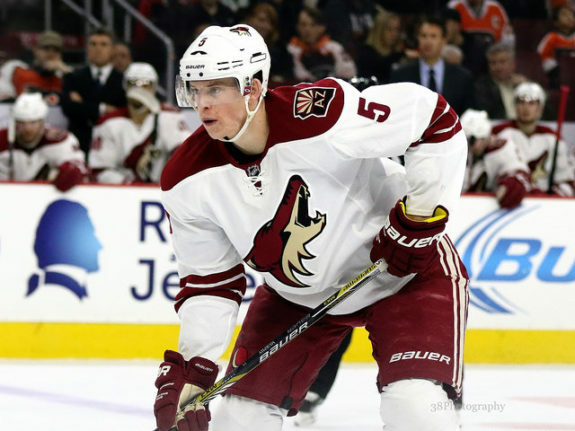 The 24-year-old Murphy has played in four seasons with the Coyotes since being drafted with the 20th overall pick in 2011. Scoring 13 goals and 49 points in 258 games, Murphy hasn’t been known as much of a point contributor in his young career yet either. Still, at 6 foot 4 and 212 pounds, Murphy has the size to play a physical game in Chicago. In Dauphin, the Blackhawks are getting a 22-year-old forward who has only played in 32 NHL games to date. The 6-foot-2, 180-pound Dauphin has the potential to play a depth role for the Blackhawks – a team desperate to find cap-friendly deals to fill their lineup for the 2017-18 season. Murphy comes to the Blackhawks with five years remaining on a contract that will pay him $3.85 million per season. Dauphin, on the other hand, comes with one year remaining on an entry-level deal that is paying him $745,000. If the Blackhawks keep Dauphin in the AHL for the 2017-18 season, they will be saving $250,000 with the Hjalmarsson for Murphy swap. Getting an inexpensive player like Dauphin while saving cap space on the blueline helps the Blackhawks, though, as it fills a role at forward for about as cheap as contracts come.